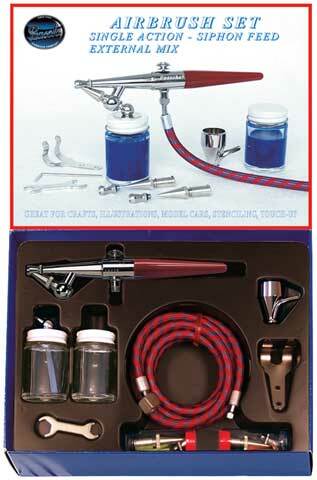 This popular single action airbrush incorporates separate air and fluid controls which enables the user to get a set line, shade, or stipple effect. The set comes with a 1/4 oz. color cup, 1 oz. bottle assembly, a 1 oz. storage assembly, hanger, wrench, 6 ft. hose and a lessons booklet. It contains all the needed accessories to easily convert between fine and medium line sizes ranging from 1/32" to 1" using India inks, stains, oils and watercolors up to 1-1/4" using the previous media plus thinned glazes, lacquers, enamels and varnishes.